Tamra Adams: Mental Health on Campus: What Can Faculty Do? In October of 2016 I traveled to Halifax, Nova Scotia to give a keynote at a conference there. I had one afternoon free during my visit, and used it to walk along the beautiful (albeit cold) waterfront. I brought a book with me, as I always do, and after my walk I sat down at a coffee shop to read for an hour. I still vividly remember thinking two related thoughts as I read The Meaningful Writing Project: I wanted to write about the book for the Chronicle of Higher Education, and I had to get one of the authors to deliver the 2018 Innovations in Higher Education Lecture at Assumption College. 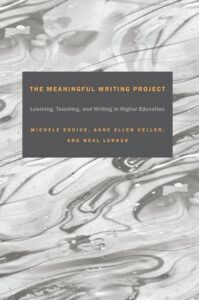 Describe a writing project from your undergraduate education that was meaningful to you. Explain why it was meaningful. The authors spent several years interpreting and categorizing the responses to those two questions. Working with a team (which included undergraduates), they supplemented their survey data by interviews with two groups: (1) a subset of the survey respondents, and (2) faculty members who had created meaningful writing assignments. The results have tantalizing implications for those of us who design writing assignments — whatever the discipline, and whether they are for a first-year writing course or a senior seminar. The book offers a small number of thought-provoking principles that any instructor can consider when crafting a writing assignment–and although I’m not sure the authors would agree with me, I believe those principles would apply to the crafting of non-writing assignments as well, including presentations or projects of any kind. I describe the principles articulated in the book in a little bit more detail in my Chronicle column on The Meaningful Writing Project. When I returned from Halifax and discovered that one of the authors of the book had taught at Clark University across town from us in Worcester, I reached out to her immediately. I am therefore thrilled to announce that Dr. Anne Ellen Geller, Professor and Director of Writing Across the Curriculum at St. John’s University, will be giving the D’Amour Center for Teaching Excellence’s Innovations in Higher Education Lecture during the common hour (11:30-12:30) on Tuesday, February 13th, 2018. Later that day, from 3:30-5:00 pm, she will conduct an optional workshop, aimed at RWI instructors but open to all faculty on campus, on making meaningful writing projects in any course. We’ll ask participants to bring a writing assignment or even just the idea for a writing assignment to the session, and Dr. Geller will help walk us through a process of making it as meaningful as possible to our students. Dr. Geller will finish her day with us by joining the Course Innovation Academy for dinner and discussion. 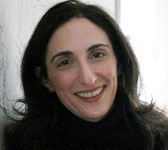 Dr. Geller’s visit will present us with an incredibly valuable opportunity to enhance our conversations about how to help our students become better writers, as well as how we can help them find meaning in the work we ask them to do. I hope you will join us for what promises to be a fascinating conversation. The Innovations in Higher Education Lecture is free and open to the public; Assumption faculty (including all full and part-time faculty) will receive an e-mail with a request for RSVPs for the afternoon workshop.